THIS IS EXTRA LARGE AQUARIUM KIT SUPPORT AQUARIUMS UP TO 300 GALLONS. YOU WILL GET AS PICTURED SKIMMER BODY AND ALL PLUMING. IT IS MISSING PUMP. NO PUMP INCLUDING. YOU NEED TO BUY YOUR OWN PUMPS TO USE THIS SETUP. 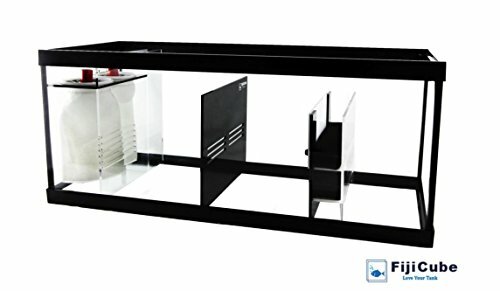 This DIY sump kit is designed to convert a 20 gallon long glass aquarium tank into a fully functional sump. The kit includes: 1 x filter sock holders (hold 2 filter socks) 2 x filter sock silencers 2 x filter socks (200 micron) 1x fixed height baffle slot (1st slot) 1x water height adjustable baffle slot (2nd slot) 2x bio-foams 2x media trays (to hold foams or filter media) 1x bubble trap baffle slot (3rd slot) **The glass tank and the protein skimmer are not included and are for product photo display only. **Color of the silencer plate may be different than the picture. 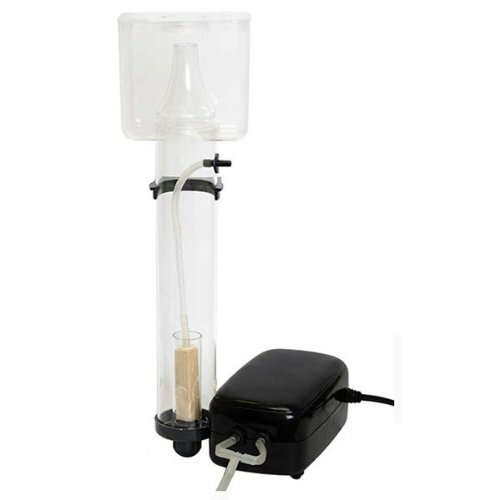 The new JBJ rimless protein skimmer; Idel for rimless aquarium 20, 30 and 45-gallon;the compact foot print and is easy to install; effcient, durable and reliable with solid construction; provides with a skimmer that outperforms but one that also delivers daily leaving you worry -free with out micro bubbles; this sleekly designed protein skimmer is simple to set up, and easy to operate. Drop in, ready to skim. Completely re-engineered to push the limits of all-in-one skimmers, the skimmer ghost Series is packed with a plethora of performance driving features that propels organics out of your aquarium water. These user-friendly, recirculating protein skimmers are equipped with bubble plates, integrated air silencers, and needle wheel impellers, all housed in a pearl white body that embodies a fresh modern look on its' exterior and an array of performance features on its' interior. 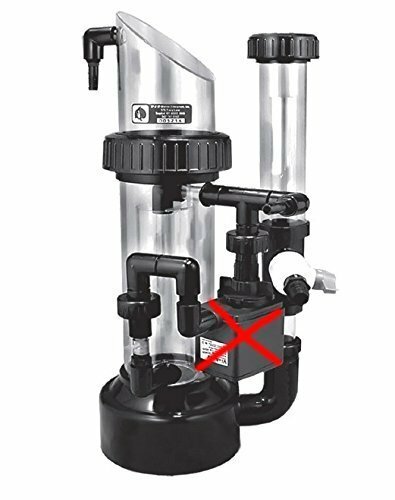 Recirculating design - passively recirculates bubbles for maximum dwell time drop-in convenience - preset to optimal water level and eliminates the need for Extra accessories. Enlarged air silencer box- integrated into the skimmer's body for a seamless look while reducing noise. Bubble plate diffuser - reduces Turbulence inside skimmer to improve skimmate production adjustable air valve - provides air intake control needle wheel impeller - produces dense micro bubbles cup drain elbow - prevents overflows airline management - keeps airline organized and "kink free" suspended pump design - reduces vibration by suspension self-draining - eliminate messy maintenance low profile cup design - keeps your skimmer hidden from view. 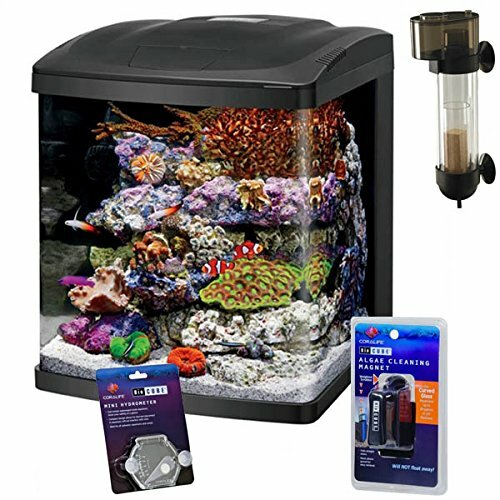 This REEF PACKAGE combines the Size 16 LED BioCube with the BioCube Protein Skimmer along with a FREE BioCube Algae Cleaning Magnet and FREE Coralife Deep Six Hydrometer. The Coralife NEW STYLE Size 16 LED BioCube Aquarium features LED lighting and timer capabilities-taking it to the next level of all-inclusive aquariums. Just like older BioCubes, it has a compact and customizable filtration chamber, hinge-top canopy design, quiet submersible pump, dual intakes, adjustable return nozzle and clear glass back panel for easy refugium set-up. Compatible with all existing BioCube accessories. Functions as a power filter and venturi protein skimmer. Provides aerobic biological filtration plus mechanical and chemical filtration for all aquariums up to 55 gal. 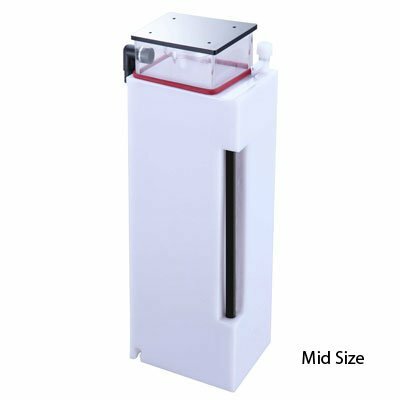 Excellent filter system for marine reef aquaria when used in conjunction with a canister-type power filter. Tee, elbow, cross, joiner, with barbed ends. 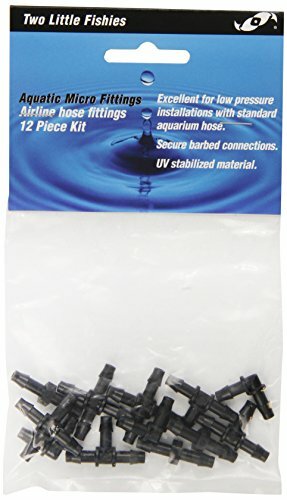 Aquatic Micro Airline fittings for connecting standard tubing for air-controlled devices such as air stones, filters, protein skimmers, ornaments, etc. Also for connecting liquid feed lines for metering pumps and drip irrigation of water gardens and aquariums. 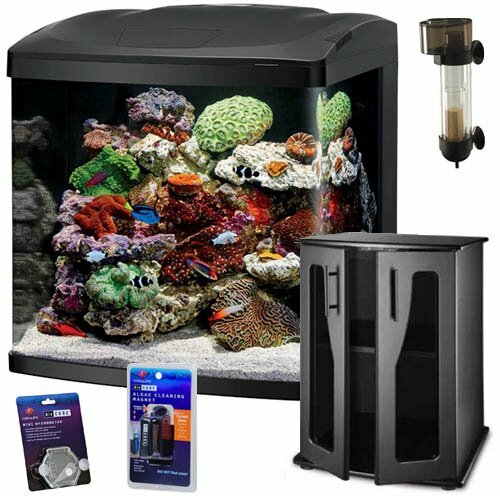 This REEF PACKAGE combines the Size 32 LED BioCube with the NEW & IMPROVED BioCube Stand and BioCube Protein Skimmer along with a FREE BioCube Algae Cleaning Magnet and FREE Coralife Deep Six Hydrometer. The Coralife NEW STYLE Size 32 LED BioCube Aquarium features LED lighting and timer capabilities-taking it to the next level of all-inclusive aquariums. Just like older BioCubes, it has a compact and customizable filtration chamber, hinge-top canopy design, quiet submersible pump, dual intakes, adjustable return nozzle and clear glass back panel for easy refugium set-up. Compatible with all existing BioCube accessories. Included is the NEW AND IMPROVED BIOCUBE STAND. This NEW & IMPROVED VERSION features a solid back panel for added stability. No glue is required. 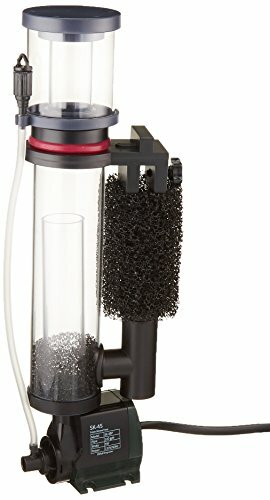 Looking for more Protein Skimmer Kit similar ideas? Try to explore these searches: Tatum Bath Fixture, Kichler Cottage, and State Wolfpack Bar Stool. Look at latest related video about Protein Skimmer Kit. Shopwizion.com is the smartest way for online shopping: compare prices of leading online shops for best deals around the web. 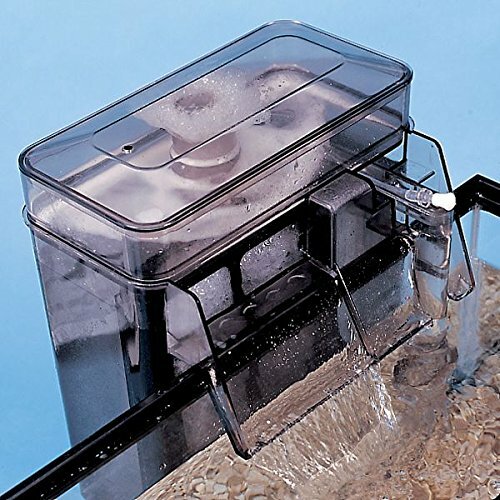 Don't miss TOP Protein Skimmer Kit deals, updated daily.